SACRAMENTO, CA--(Marketwired - Apr 20, 2015) - A broad coalition of California Proponents are filing the open-source voter initiative, the 'Marijuana Control, Legalization and Revenue Act of 2016' (MCLR). Proponents will be at the state capital for the filings at 11am, then will travel to the 4/20 celebration at "Hippie Hill" in San Francisco, CA to join the festivities at 4:20pm. Today's filing advances the Americans For Policy Reform (AFPR) inclusive and open-source process. Many applaud the transparent method of drafting the initiative, which brought in concepts and concerns from thousands of citizens throughout California. "We hope this broad-based coalition of support will encourage further cooperation," states John Lee, MCLR proponent and director of AFPR. "We urgently encourage other advocacy groups to join us at the table." MCLR was developed in 2014 as the first "open-source" method for advocates and experts everywhere to contribute directly to the language of California's marijuana legalization law. In early 2015 the AFPR team and a group of activists, cannabis club operators, and attorneys began working on the 2016 language. 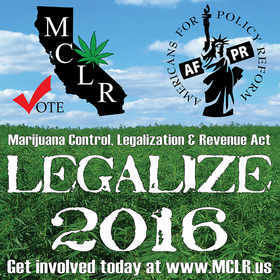 To date the MCLR project has been the most inclusive approach ever created for marijuana legalization in California. The AFPR team will continue to take input from the community during the new public comment period and make any necessary amendments. "We have worked hard to bring people together and create the best law possible for legalization in California," says Dave Hodges, MCLR proponent and founder of the All American Cannabis Club. "MCLR creates a comprehensive set of regulations to allow all types of cannabis businesses to flourish, and will net California billions in tax revenues." Americans for Policy Reform has filed a legalization initiative for marijuana in California.